If you have been surfing the web for more than a year, then you probably have experienced the HTTP 500 internal web server error a few times. 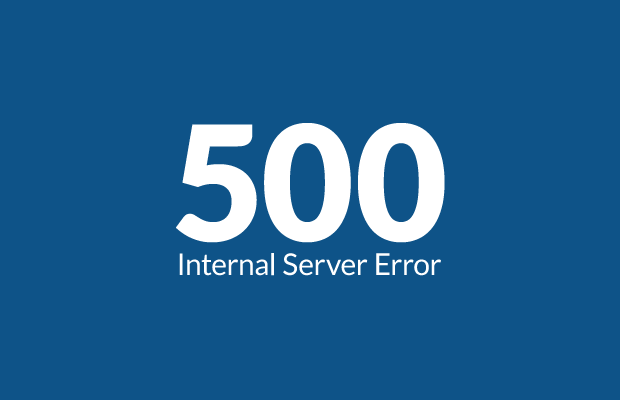 500 Internal Server Error is one of the most common errors that can put a web owner and user in a panic mode. It usually occurs when the programs and scripts that run on a website break down. But why it occurs and how it can be fixed? To get the answers to these questions, let’s have a look at the article. Why do you get Internal Server Error? Internal web server error not only exists in WordPress but it can occur with anything else on your server. It’s a common error which is hard to fix if the developer does not know the reason of it. This error in WordPress is often due to plugin or theme functions. Some other possible causes of internal web server error 500 are PHP limited memory and corrupted .htaccess etc. How to Fix 500 Server Error? Normally the internal error 500 displays on your browser while opening a website and it’s mostly related to the network. So, here I’ve listed some easy solutions to fix it. Take a look at them! Internal web server error occurs when registry entries related to the network settings and browser data have been expired or overloaded. So, if you want to fix the server error, you have to repair these registry entries using a System Utilities Software. Then click on Fix Now when the scanning is completed. A corrupt .htaccess file can also cause a 500 Web Server Error. Because when you upload a file with the.htaccess file type, it may include some invalid instructions that can corrupt it. So, to fix the 500 error, you have to delete this file from your server or make its instructions correct. For this, you may need a software that allows you manage the stored files on a server computer. Corrupted and stored files in the browser cache can also lead 500 web server error. So, if you want to fix it, you have to clear the browser cache and temporary internet files from the browser. You can do this action by using a System Utility software. Just click on System cleaner and then hit the clean button to clear both locations. Problems with the PHP connections may also lead the error 500. The delay due to time-out in loading files on your server may be the cause of this error. Hence, you can remove the external connections in order to fix the web server error. Resetting all the settings of your web browser is also a good solution for fixing the internal web server error 500. This error can occur because of any incorrect setting of a web browser. Here is how you can reset your internet explorer. Click Tools, then go to Internet Options. Click the Advanced tab and then Reset button. Select the Delete Personal Settings box as checked. Click Reset and then OK button and restart Internet Explorer. Plugins found in WordPress can also become a source of the web server error. So, if you have access to the admin dashboard of your WordPress site, then deactivate all plugins one by one and refresh your website. If the error happens even after the investigation of above-mentioned causes, then it is recommended that you should make a contact with your web hosting service provider. You can place a request, then the technical experts will resolve your internal web server error by going over your server settings. Previous Previous post: How Can I Improve My Website Speed?